Daisy the Curly Cat: Circus Cat Attire! A long time ago, I modeled this beautiful circus clown suit, and Harley wore this wig for Halloween. But I got the great idea to wear them together! This is my most colorful suit ever. I am really ready to join the circus now. 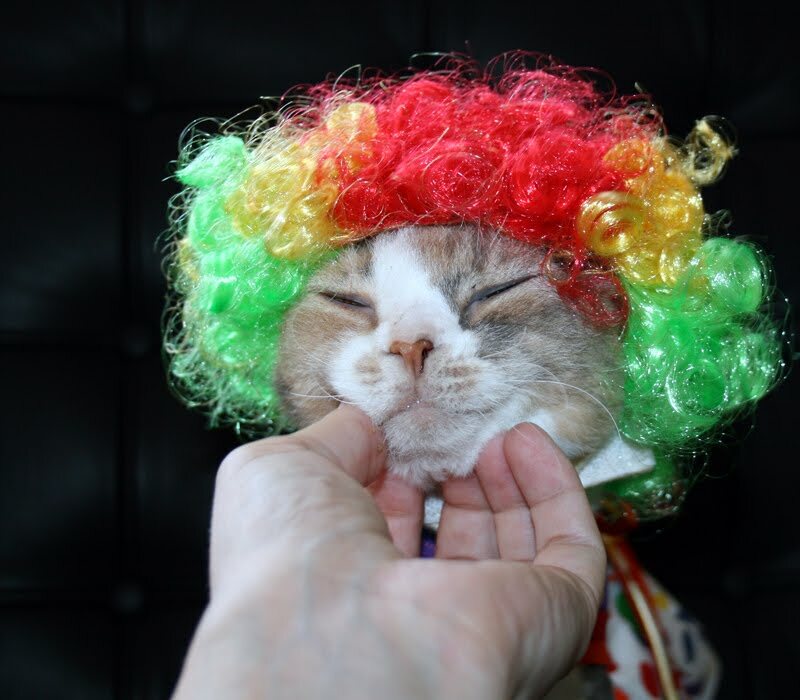 A clown cat must practice tricks. This is my best trick. Paw bump! I got lots of rewards for modeling so good. My favorite, chin scritches! And I got to eat the treat crumbs! After modeling, I like to relax by gazing at the scenery. Have a colorful, fun day! Yay, another paw bump! For chin scritches and treat crumbs, I might be tempted to put on a clown suit too. you really seem to like those chin scratches. Thanks for coloring my Friday brightly!! You do give a splash of color to the landscape. Beautiful outfit... Have a great day! Oh Miss Daisy! You're so bootiful, even in such an outfit! Did you know we have a clown college in Lake Placid?I'll refer you there.What will your clown name be? Looking good, as always. You are such a cutie pie. You certainly are very colourful Daisy. Chin scritches are the best and we can see you are enjoying yours. 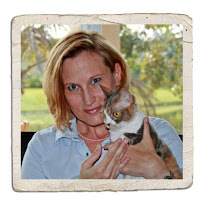 I love the last one -- Clown Cat in Repose circa 2010. Miss D, I would go to any circus you were in!! I wonder what the neighbours think when they look in the window and see you!! Who doesn't like chin scratches? Wonderful outfit Daisy. You've brightened my day! I luvs clowns, Daisy. You are wonderful!!! You have a colourful and fun day too Daisy! You have helped me overcome my clown phobia! You have really helped me overcome my clown phobia! Thanks! Daisy, you look beautiful as always! 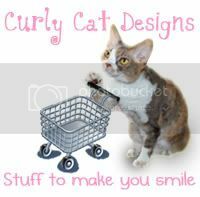 Are you familiar with the whole Kitty Wigs (kittywigs.com) sensation? I bet you would like fabulous in one of their wigs. Great clown outfit there, Daisy! It is fun being a clown! I love to give chin scratches to my Manny Boy--he even purrs for me sometimes! Happy weekend to you and Harley! That is such a great outfit Daisy, it made our Mom smile a bunch. Very colorful, that is for sure and the hat fits really well. And that paw bump is the very best of all. That is terrific Daisy. We will get that Google trained. Daisy, you are so colourful today! We love the side profile with the hair coming down to your shoulders. And the photo of you eating the crumbs. Mummy had to look a second time to really appreciate the colourfulness of your hair! Your paw bump is so beautiful! PS. Mummy has been trying to take a closeup of Yuji's face and beauty spot... he never keeps still! i am a little bit scairt of clowns daisy. but i am not scairt of you honey pie. Good golly Miss D. Your suit has all of the colours of the rainbow! Any circus would be proud to have you Daisy ! You're outfit is great. We're always amazed by how well you wear hats and wigs!! gotta say very few could pull off that look but you somehow manage to do it. Yoo are a wunnerful clown Daisy. We hope yoo gots treats and not just da crums! You really brightened up our Friday Daisy and we loved your costume - Have a lovely weekend with Harley and your mom and dad. Hope you get plenty of treats and chin scritches. HEE HEE HEE! Daisy, that photo of you nibbling on your treat crumbs in your clown wig really tickled me. You are very colorful INDEED! You look very colorful indeed. You are such a great model, very professional looking. You are my fashion guru Daisy! I love allyour clothes, you look fabulous in everything! Daisy, we think that Tripper might want to borrow your very colorful outfit! That is a fun and festive outfit, Daisy! You pull it off beautifully, sweet girl! Wow! Daisy-Face, you are BRIGHT! And CHEERY! I think you should mail yourself to Miles and his The Mom for their Gotcha/Birthday Days! Daisy, you are a vision in stripes and polka dots! and frizzy hair. That is a totally stunning combo, Daisy! We love it! Daisy...your ready for the big top for sure! That is one silly wig! But you look cute in it - You can rock anything! I bet it is a very fun day in your house! I like all those colors!!! You really are ready for th circus! I have never seen you so colorful before. Lovely weekend! Daisy, yoo make the prettiest clown we have EVER seen! We thinks you would be a great addition to any circus and we would love to see you in person. U look so cute! I wish I had a neat hair. Hahahahahaha, that is so cute! 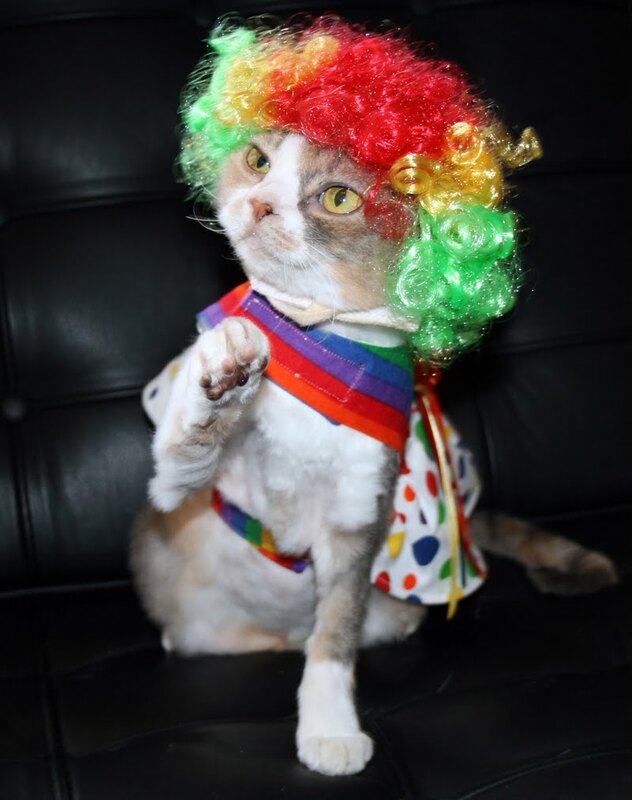 You do look great in your clown outift Daisy, but we don't want you to join the circus cause we wouldn't be able to see you as often. Your outfit has a dual use...you could march in a Gay Pride Parade! At least, that's what my Mommy's Gay friend Steve said. Either way, you look amazing in that wig. You make a great clown, Daisy...cute too! Some people think that clown are scary but you are the cutest clown I have ever seen. That wig just made me smile. You deserved every one of those chin scritches. You are a very cute clown Daisy! Seems that you really like that rainbow hair too! We had our doubts at first, but we have to agree: the wig works. But of course you look fabulous in everything. But please don't run off to join the circus (unless you are planning to tour the Netherlands with it). That certainly is your most colourful outfit to-date, Daisy! And, of course, with carry it off with aplomb. I like the way you are so comfortable in your outfits, and don't mind wearing them. Even though Domino is a good model, she likes to take her clothes off right after a photoshoot. You look so good as a clown Daisy! I bet you always get the center ring. You are a beautiful clown! And the best model ever! Oh my, what a lovely splash of colour! It's either the circus or the carnival! That is so wow!! I love your colorful wig! 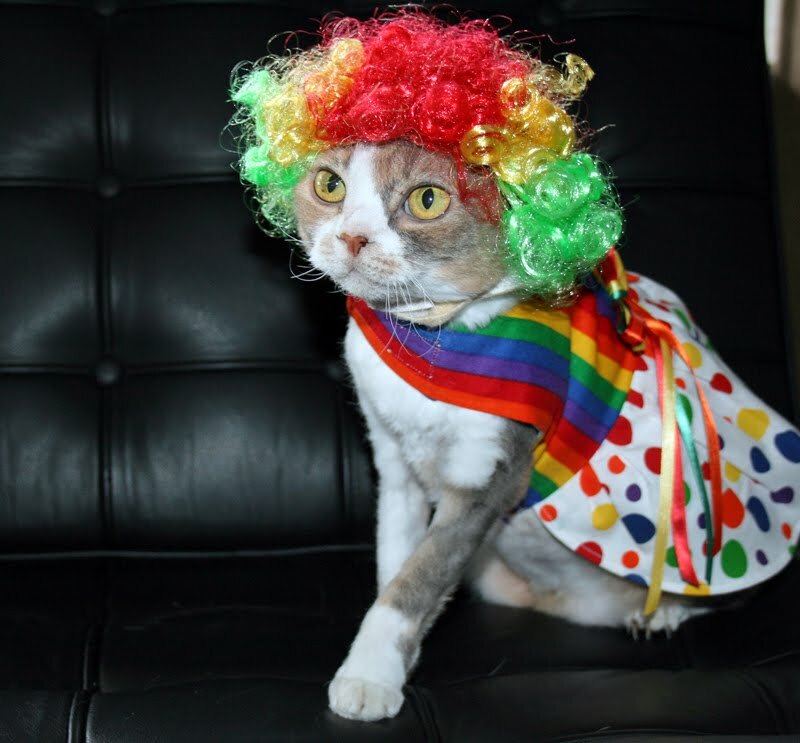 Daisy, you're the most beautiful clown cat ever. We LOVE the chin scritches picture, you're smiling!! haha, you must really love dress ups. and you really should take a walk on your harness soon, daisy. its good exercise and lots of fun! What a very colourful outfit, Daisy. The clown suit and wig go great together! Daisy! I can't believe you can just wear that stuff and not think to yourself... "I might be able to scare children now!" Do you have a little tiny car that you and 19 of your friends can ride around in, too? Do you take the wig off when you nap? I think you should keep it on. You earned your treats and scritches today, Daisy. 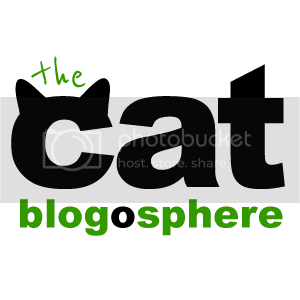 "Daisy the Curly Cat" has been included in this weeks A Sunday Drive. I hope this helps to attract even more new visitors here. omg Daisy I just want to squeeze you!! Daisy, you make anything you wear look great! And no matter what you're wearing, you always retain your regal dignity. 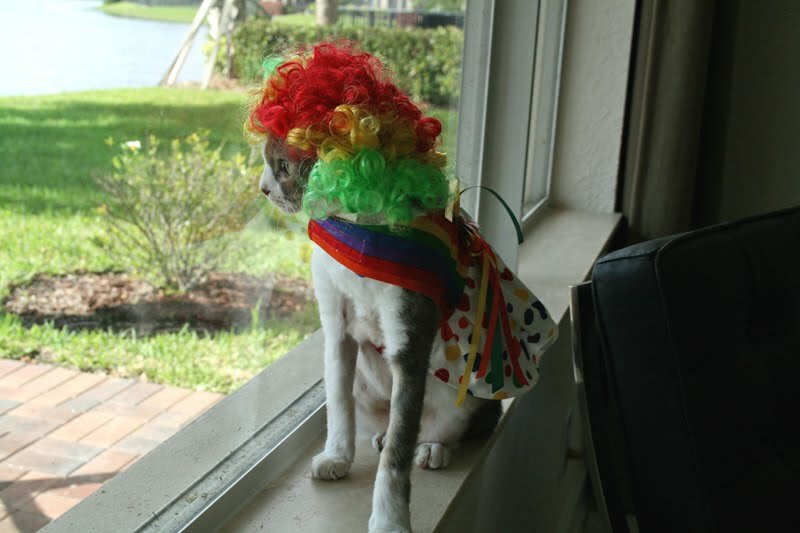 You wear the clown suit well, furry friend. That was a beautiful smile you gave for your chin scritch! bonkbonkies to you and Harley! Oh Daisy, thank you for making my mom laugh. You look so cute in your outfit and so colorful! Oh, you're so colorful, Daisy! Mom says that's what her hair looks like in the summer, 'cept it isn't stripey colors. Yes, try the calming collar. For only $15, it's worth a try. It's helping Max. 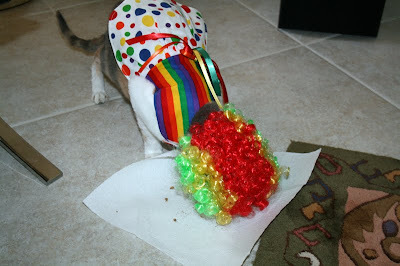 Daisy, clowns normally frighten me, but you are just so cute in your clown outfit, I forget how creepy some of them are! It just shows how great you model, and you really make those colors pretty!